Carole King and Gerry Goffin were one of the most prolific songwriting teams in history. Even though they churned out the hits on demand, many of them still abide today. 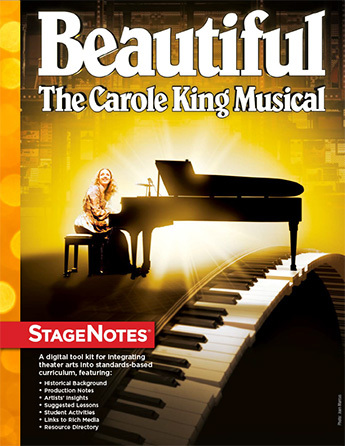 Beautiful–the Carole King Musical tells the story of their partnership and marriage through the songs they wrote together. It is a picture of a very specific time in history with lessons for us all. This tool kit gathers the resources and activities that will help educators share this time and these people with their students while connecting it to what they are learning in the classroom. From a language arts lesson on creative non-fiction to a history lesson on the Equal Rights Amendment and even a life lesson about kindness, students will find that this show is not only entertaining, but inspiring and engaging. As you’ll read in Douglas McGrath’s “A Note from the Playwright”, the story of Carole and Gerry and their friends Cynthia Weil and Barry Mann are not what you would expect. The story of this musical journey is unique and we are all invited along.